Apple has been as productive as a company can expect to be over the last few weeks. A plethora of hardware and software announcements have thrust the company into the media and public spotlight, with the subsequent releases of those products ensuring that the focus remains on the Cupertino-based company. Now, the wait is finally over for all you Mac owners out there. After months of testing and development, Apple is finally letting you download and install Mac OS X 10.11 El Capitan for free from the Mac App Store. Apple initially introduced the world to OS X El Capitan during this year’s Worldwide Developer Conference (WWDC) back in June, as has become company tradition. In the months that have followed that announcement, we have been privy to a number of beta seeds that have been issued to registered and enrolled members of the Apple Developer Program, to help them build El Capitan-specific software, as well as allowing them to upgrade existing apps to offer 10.11 compatibility. Apple also took the unique step of opening up the El Capitan pre-release cycle to members of the public via its public Apple Beta Software Program. As we’ve mentioned a number of times in the run-up to this launch, OS X El Capitan is all about improving reliability, stability, and the underlying performance that’s experienced by end-users. Rather than offering sweeping visual and functionality changes, El Capitan has a dedicated focus on stabilizing things under-the-hood, which is similar to the iOS 9 ethos in that sense. With that said, there are a few nice little feature improvements that users can look forward to, such as the introduction of Split View apps, an improved Mission Control, and a highly improved Spotlight Search experience. 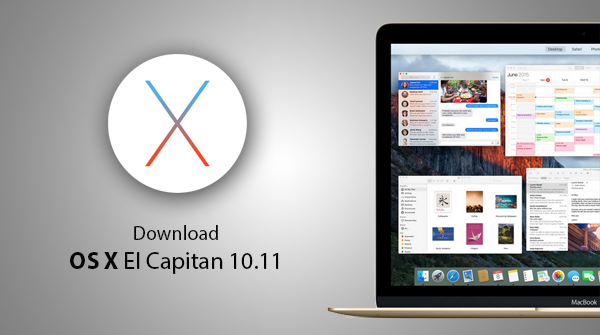 You can download OS X El Capitan 10.11 right now from the Mac App Store here and upgrade from there. If you wish to do a fresh install (recommended) on El Capitan on your Mac, you can follow the instructions for it here: Clean Install OS X El Capitan On Your Mac The Right Way, Here’s How [Guide]. 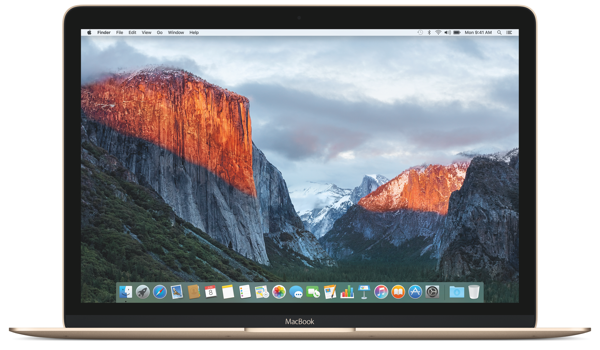 If you haven’t already done so, you may want to take a look at our advice on how to prepare yourself and your machine for the installation of El Capitan: How To Prepare Your Mac For OS X El Capitan [Guide]. 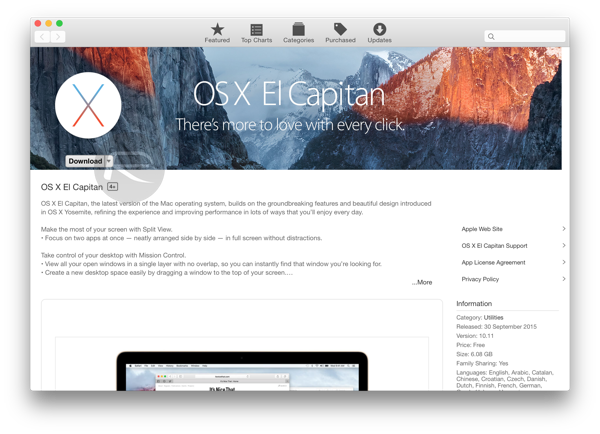 just go to app store —> search for El capitan —-> download and install..
Been using it for about an hour. Best change so far is they have finally sped up those annoying transitions to full screen and opening apps. System feels soo much better. They need to do this on IOS. 2x or 4x animation speeds would make their phones feel much snappier. in essence, you need DOS OS – a terminal with instant epileptic window update. Yes, iFags, go for it. “well system feels so much better” please don’t surprise Tim Cook he has already released the next public beta for a hell lot many bug fixes. He is just in the shock of iPhone not selling and your words might kill him for good. The comedic value in your comments have sudsided recently. I generally enjoy your banter, one of the best pats of Redmond I think. I think you need to pace yourself. Why do i sense you are trying to be the new Patrick V. At least he is funny. I’m no Apple rose tinted consumer as I feel I probably bash them more than compliment based on my own “real life experiences not theories”. Tim Cook is irritating but I don’t really care what he thinks. I care what I think because I’m spending my money and time using the products I choose. If it is tims he can tell all his friends about it if he wants. And I still don’t care. I am going to install it on my MacPro running 10.10.5, but only after 10.11.1 is out.